The last time Anna and I went to London together we marked the fact that she had just entered the “double digits” – she was 10 and mostly wanted to hang out at Harrods’ toy department and Yo Sushi. Last week we left our guys at home to celebrate her upcoming high school graduation. What a difference eight years does and does not make. My girl and I took off for our five-day extravaganza with a vague plan to see some shows, eat at Yo Sushi (again) and shop. And then squeeze in a few museums between more shopping. That’s what I thought we agreed to in principle, but then reality reared its black and white head. I observed a side of my daughter I intuited, but couldn’t exactly articulate before our trip. Anna, princess over the sloppiest sovereign space in our house, likes order, craves structure. I get claustrophobic at the thought of being tethered to an organized tour. Not Anna. She likes to climb up to the top of that double-decker bus and listen to the guide. On Day 2 of our London adventure we went on the London Eye – a super slow Ferris wheel, powered by sustainable energy – that eventually provides panoramic views of London. Compared with eight years ago, Anna was not as happy to pose in front of various landmarks in our little bubble compartment – “Go, go there’s a great view of Westminster Abbey,” I said a bit too shrill. “How many times can you photograph Big Ben?” asked Anna, princess of the perfect eye roll. After we hopped off the London Eye, I thought we’d pop up to Madame Tussauds. After all, Anna loved Posh and Beck’s wax figures on our last visit. But my girl had my number. She knew I was willing to schlep on the tube and suffer through two transfers just to get a picture of me standing next to Colin Firth’s heart-racing likeness. Colin was featured in an advertisement for the iconic museum at a tube station. “Don’t even think about it,” warned Anna, princess of the perfectly raised eyebrow. She told me to step away when I approached the poster. One person’s idea of vandalism is another person’s idea of procuring an innocent souvenir. Eight years on, and a wisecracking teenager had replaced my little girl. But I found my sweet girl the next day on the Harry Potter tour. The last thing I wanted to do was go to the English countryside to look at ossified movie sets from the various Harry Potter movies. But this was Anna’s trip, so I shelled out way too much money for the two of us to go on the tour. I love Harry Potter as much as the next person. I took Anna to a bookstore at midnight for one of the series’ releases so she could be the first kid on the block to read the doorstopper of a book. The anticipation on her face on that long ago night was delicious. There was the same look when she happily posed in front of a replica of the Hogwarts gates. I loved watching my daughter having so much fun strolling through the Great Hall and peering into Harry’s closet bedroom under the stairs of 4 Privet Drive. 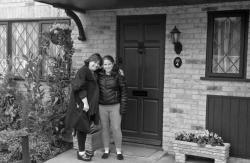 And, yes, we posed for a picture in front of the exterior of what is arguably the most infamous Muggle house in the United Kingdom. At night back in London, we strolled on the Strand or in Covent Garden. We also made a nightly stop in the hotel’s business center to check Facebook – hers and mine. Subtle parent that I am, I asked her what was new on her page. “Everything’s fine,” she said gently. The next day Anna and I went to the Queen’s Gallery in Buckingham Palace and saw an exhibit of Leonardo Da Vinci’s anatomy drawings. I was astonished by the way my daughter so carefully went through the exhibit and pointed out the flaws as well as the prescience of Da Vinci’s work. Suddenly, I realized that more and more Da Vinci moments would replace the Harry Potter ones. Little girl. Big girl. The next time we go to London, Anna will be a woman, and I will finally pose next to Colin. “Philosophy,” Plato once said, “begins in wonder.” Rabbi Danya Ruttenberg quotes Plato early in her intelligent, luminous memoir Surprised by God: How I Learned to Stop Worrying and Love Religion. Rabbi Ruttenberg’s moving inquiry into faith is consistently inspired by her ongoing sense of wonder and appreciation for Judaism. She grounds her exploration in story—her story and the stories of our ancestors—and ultimately offers readers a blank page to write their own stories. During her year of mourning Ruttenberg attended synagogue almost every day to say a prayer of mourning she did not initially understand. Her persistence paid off and she gradually became familiar with daily services. Na’aseh v’Nishma—we will do and we will understand. It’s the transformative response from the Israelites as Moses reads the Torah for them for the first time at the foot of Mt. Sinai. Ruttenberg’s early religious practice exemplifies Na’aseh v’Nishma. When she consistently does, she is graced with spiritual insights. She lives for those moments and learns how to access them through meditation. Grief often bubbles to the surface. “There are many halls in the King’s palace, and intricate keys to all doors, but the master key is the broken heart,” said the Ba’al Shem Tov—the father of Hasidism. I thought of the Binding of Isaac. On Rosh Hashana we read about his near death experience as a sacrifice to God. One midrash points out that Isaac not only accepted that he would be sacrificed, but on the altar he asks his father to tighten his bindings so escape is impossible. Kierkegaard argues that the story is bearable because in the end Abraham did not believe that God would allow him to sacrifice his son. Although he was seemingly prepared to kill Isaac, Abraham went through the motions with a profound trust that God would do the right thing. She sensed the group’s skepticism about achieving kavanah—intentionality—in a crowded synagogue. How can intuition complement set prayer? How can one create a meaningful space in a crowded row of seats? And how can one experience spiritual solitude in a makeshift sanctuary accommodating an overflow crowd? Personally, I was not convinced any of these things can be achieved. But like Abraham, maybe God wants me to be there, needs me to be there to participate in the conversation. Language is both the most and least effective tool we have for reaching God. Rabbi Nachman of Bratslav often went into the woods alone to address God out loud. On the advice of my rabbi, I’ve tried to talk to God a couple of times when my house empties out in the morning. Even though I’m alone I’m self-conscious, as if someone is watching me talk to an imaginary person. Only grief snaps me out of my uncomfortable awareness of self. A few months ago I was driving home from an evening meeting. My best friend had recently died. Suddenly grief overtook me. I pulled the car over. The soft clicking of my flashers kept time to my wailing. Sometimes I miss my friend so much that I am sure I will never be able to climb out of the void her absence has created in my life. “There is nothing more whole than a broken heart,” says Rabbi Nachman. I like that saying for its intense grouping of joy and sadness, but I never quite understood it until that night in the car. Broken heartedness is the time when we are most open to God in our fragility and vulnerability. “I hate you God,” I screamed. At that moment only those words could serve as my prayer to God. And I have a hunch that the Gates of Weeping lead to the backdoor of God’s palace. Somewhere in the world there is a still-traumatized man who had the bad luck of delivering a package to me when Anna – at that time the world’s worst sleeper – had finally gone down for her afternoon nap. She was four months old and at the cusp of real sleep when a UPS man rang the doorbell to have me sign for my neighbor’s package. Anna startled awake and began to scream. “You put her back to sleep,” I hissed at the unfortunate soul. I wasn’t buying it. I told him that if he sees a stroller on someone’s property, never ring the doorbell in the middle of the day. He muttered that he was sorry and slunk away. Anna was still crying at an unnaturally high pitch, and I had to start “the process” all over again to get her back to sleep. I’ve heard incredible stories about children falling asleep in their car seats and transferring to their cribs without making a peep. Children who ball up their sweet little fists to rub their eyes and promptly drift off into a midday nap for three hours. What did the mothers of these children eat during their pregnancies? My children were, to put it mildly, sleep-challenged. I never had the heart to let them cry themselves to sleep, and so I was in turn very cranky with sleep-deprivation. In our early parenthood, Ken was a stalwart follower of Dr. Ferber – the baby sleep doctor. He began the one step forward, two steps back approach of letting our children cry it out, checking on them every 15 minutes until they fell asleep in a puddle of tears and aggravation. This is popularly known as “Ferberizing” your baby. But children are wily opponents, and when Ken was away on business, they knew they had me exactly where they wanted me. They went right back to starring in their bedtime soap operas with me as the hapless stage manager. The eagles who soar through the sky at rest And the creatures who crawl, run and creep. I know you’re not thirsty. That’s bull s***. Stop lying. Lie the f*** down my darling and sleep. Before the book was published, it went viral amidst a flutter of tweets from a reading that Mansbach gave in Philadelphia. Soon after, booksellers received a PDF file of the book from the ecstatic Brooklyn-based publisher, Akashic Books. The book was forwarded until it landed in inboxes of folks who had never met a bookseller. 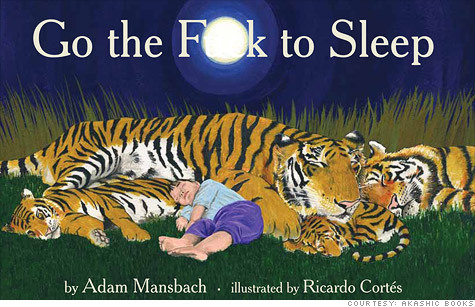 Go the F*** to Sleep soared to the top of Amazon’s general best-selling list. The buzz around the book was so deafening that the publisher moved up the just in time for Father’s Day last year. Film rights have been acquired, the book is to be translated into more than 12 languages, and there is an audiobook version read by the actor Samuel L. Jackson. When I first came upon Mansbach’s book I filed it away as a column idea and moved on to final exams with Anna. Lo and behold, there was an excerpt from Mansbach’s fine literary novel, The End of the Jews, on Anna’s Biblical literature test. The book is the complicated story of three generations of one Jewish family and was lauded as “beautiful and heartbreaking and brilliant.” The passage on Anna’s test was a deep slice of life from a portrait of a marriage, remarkable for its bruising realism and painful resonance. A wife misreads her husband’s social cues, and he tortures her for days with the silent treatment. Anna’s task was to explicate the consequences of speaking up to an emotionally abusive husband versus taking the easy way out and ignoring him until his bad mood passed through like a storm cloud. Mansbach is a smart, versatile writer. His work is remarkable for the way he understands the beguiling, frail and ugly humanity of his characters. So yes, my child, Go the F*** to Sleep. Your parents will recognize Mansbach’s vulnerable humanity as wise and sad and funny and introspective because that’s what a good writer can do in any genre. 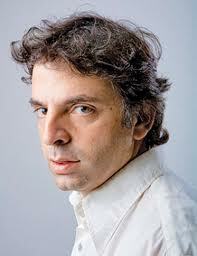 The genesis of the elder Keret’s narratives reflected his peripatetic post-Holocaust experiences. Having been refused entry into Israel after the war, he returned to Europe to acquire arms for the Irgun – Israel’s underground resistance – on the black market. He did business with the Mafia in Sicily by day, and slept in parks at night. His new business associates noticed that he was homeless and offered him an empty room in one of their bordellos. Keret told an anecdote from a recent trip to Korea to illustrate Hebrew as a frozen language “microwaved for modern usage.” In trying to explain Israeli society to Koreans, he told them that Jerusalem suspends public transportation on the Sabbath in accordance with Biblical law. His puzzled audience asked if Israel was like Iran? Keret countered that Israel is so liberal that a transgendered singer represented the country in an international contest. Completely confused, the Koreans asked him if Israel was like San Francisco? Keret responded that the answers to both their questions was yes, explaining that Israeli society is distinguished by both religious conservatism and social openness. As for his start in writing, Keret said, “I think I was a writer long before I realized I was a writer.” He began composing stories during his army service to cope with a friend’s suicide. At Hebrew University, he wrote well into the night and was repeatedly late for morning classes. Threatened with the loss of his scholarship, Keret showed his advisor those nocturnal stories as proof that his extracurricular activities were intellectual. He not only salvaged his university career, he also established his literary reputation. A few years later, that same professor edited and published Keret’s first collection of short stories. And thus his advice to aspiring writers: Wake up late. I met Beatrice Shapero, known universally as Bunny, 10 years ago in a preview class for Me’ah. Me’ah is an adult learning program that, in a hundred hours of classroom time, begins with Biblical history and continues through the founding of the State of Israel. It’s a two-year course of study. But if Bunny was up for it, what excuse could I possibly have not to enroll. As it turns out, Bunny was the coolest octogenarian any of us had ever met. In fact, she was cool, period. She was also an incredible role model. Me’ah was just one of the stops on her journey of learning and becoming. Bunny came to Me’ah already primed for Jewish learning. A decade before, she had become an adult bat mitzvah and before that, well, she did a million things for the community. 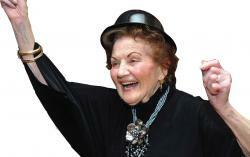 She was the young woman who sold bonds door-to door for the newly-created Jewish State in 1948. Rae Gann was the captain of her team, and for 12 years running Bunny sold the largest number of bonds in the group. Israel was so new, and Bunny never promised people that they would get a return on their money. But that was beside the point. Bunny loved Israel, and Israel needed the funds. Bunny also loves her synagogue. She’s been a member of Temple Emanuel in Newton for more than 50 years. During that time, she’s been the heart and soul of Sisterhood and the temple’s branch of the Women’s League of Conservative Judaism. No one comes close to selling Bunny’s quota of Torah Fund cards. She’s not sure how many she’s sold over the years, but at the last Torah Fund brunch she was close to moving 500 of those cards for the Jewish Theological Seminary. Bunny may not call herself a feminist, but that’s what she is. Her daughter, Susan, was the first girl at Temple Emanuel to have a bat mitzvah on a Saturday. Susan is a twin, and Bunny insisted that Susan and her brother, Martin, celebrate their b’nei mitzvah together. “They studied the same material, why shouldn’t they get the same recognition?” she reasoned. The ritual committee agreed and consented to the Saturday morning ceremony. Was Susan’s bat mitzvah in 1959 an exception? Yes. But it set an early and important precedent. Bunny is a natural at setting precedents. This year, at 88, she is the oldest participant in the annual walkathon for the National Alliance on Mental Illness (NAMI). There have been nine walk-a-thons in Boston, and Bunny has walked the three-mile course at each one of them. A founding member of the Boston chapter, Bunny is committed to NAMI because she is devoted to Martin, who had his first schizophrenic breakdown at the age of 15. “Mental illness is low on the totem pole when it comes to any kind of funding,” Bunny said. “That’s why I got so heavily involved in fundraising for NAMI the past few years.” As of Monday, Bunny had raised close to $10,000 for the organization – and that’s for this year alone. Family members with a mentally ill relative staff NAMI’s Family-to- Family program. These volunteers are trained to provide information on everything from medication to day programs. Family-to-Family serves as a resource for the latest research and as an information clearinghouse for caretakers dealing with a loved one’s relapse. The day after the walk-a-thon is Lilac Sunday at the Arboretum. It’s also Mother’s Day, and Bunny and Martin plan to spend the afternoon together at one of their favorite places among the flowers. My colleague KJ Dell’Antonia, editor of The New York Times parenting blog Motherlode, pointed out in a recent post that there are 940 Saturdays between the time your child is born and the time she turns 18. 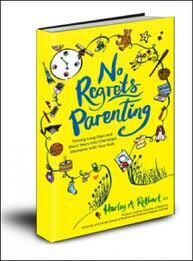 KJ’s calculation comes from Dr. Harley Rotbart, a parent, a pediatrician and author of a wise book called No Regrets Parenting. The days of early parenthood are long and chaotic and exhausting. Sometimes those days lead into nights that are puzzling or downright scary. I still remember the times when Anna or Adam’s cries broke through the scrim of night or light sleep. Ken and I felt helpless as we asked each other the same question over and over: What do you think is wrong with her? There’s an old chestnut that says the very definition of insanity is repeatedly asking the same question, but expecting a different answer. The truth is there was no answer. We never found out why our babies cried. We never understood why Adam’s colic descended like the darkest cloud and then lifted just as suddenly five months – yes, five months – later. As the mother of an almost 18- year-old who has an exact date for when she starts her first year of college, I’ve put aside Dr. Rotbart’s calculations. I simply pretend that time is still on my side. But then the finite amount of time I have with my children took center stage last week when I heard my rabbi, Michelle Robinson, sermonize about the Omer and parenting. The Omer literally means to count and that’s what’s done during the 49-day period between Passover and Shavuot. The Omer originally staked out the time during which wheat was harvested and counted in preparation for a sacrifice at the Temple. Save for the Western Wall, the Temple is long gone. But Talmudic Judaism still observes the Omer by ticking off the days between the holidays. Counting the Omer was not the only thing on Rabbi Robinson’s mind when she delivered her sermon. Like KJ, she too had just read “No Regrets Parenting.” As the mother of three children, she was deeply impressed with Dr. Rotbart’s approach to mindful parenting and his wisdom that although the days are long with young children, the years are short. It’s an interesting idea to count up. Rather than thinking about all that we have to do before a deadline we can focus on all that we get to do once we’ve reached that momentous day. Counting also provides that helpful reminder to be mindful of each day, to be aware of time passing. To be “present” regardless of whether the day or hour or minute brings joy or sorrow. So between now and mid- July, when Anna turns 18, and then four weeks later when she sets foot for the first time on a college campus as a matriculated student, I need to count up. I hope that counting up will help me to distinguish that the milestones of Anna’s life are not the tombstones of my parenthood. I will try not to think of what I’m losing, but what I am gaining by sending my girl off to school. First and foremost, Ken and I are giving our daughter one of life’s most vital resources – an education. As my mother used to say, no one can take your education away from you. My mother was all about independence for her daughters. She went back to school for a teaching degree when I was 5 and never looked back. A few years later, after she landed her first full-time job, she opened her own checking account and contributed significantly to her three children’s college tuitions. Maybe this next phase of our family life will be as exciting for me as it will certainly be for Anna. After all, I won’t have to drive the 15-mile round trip to her school when she forgets her soccer cleats. I won’t have to look at the messiest room in town every day. But I know I’ll get weepy when I see the return of that sloppy wasteland because it means Anna’s in residence. I envy KJ, Michelle and Aliza for the hundreds of Saturdays still ahead of them with their kids. As for me, I have 11 Saturdays until Anna turns 18 and 15 Saturdays until she leaves for college.